With the holidays approaching far more quickly than most would care to acknowledge, toy shoppers are thinking about what to put on this year's Christmas shopping list. The hot list of toys includes everything from droids to plush pals and more. With so many choices out there and many varied thoughts as to what will be at the top of this year's wish list, here is a list of the toys cited as standouts, drawn from a variety of toy-centric entities. What could be better than a toy that makes toys? 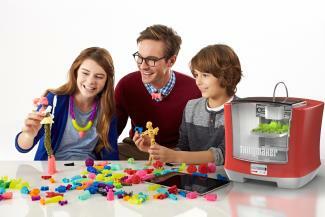 Thingmaker is a 3D printer that will let your kids make their own creations. Working in conjunction with an exclusive app, the combining of different figures, colors, and features presents hundreds of toy variations that once finalized, can be sent to the printer and made just for them. The cost is $300.00. Almost too cute for words, this adorable little droid is the perfect companion for a Star Wars fan who love remote control toys. With gyroscopic motion, this app-enabled droid emulates the real character so it can be maneuvered almost anywhere. 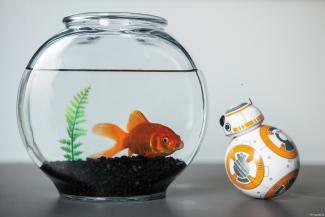 The more interactions, the more BB-8's individual attitudes and actions will become its own, and it can recognize and react to the voice of its "owner." Cost is $130.00. Pre-schoolers will be getting a lesson in coding without realizing it as they switch segments around on this adorable little caterpillar. With each change comes a new path, sounds, and lights. There is one sound, two right turn, two left turn, and three straight segments that will create endless combinations that are sure to tickle everyone, and as they become more adept, they will even be able to set up targets. Cost is $50.00. 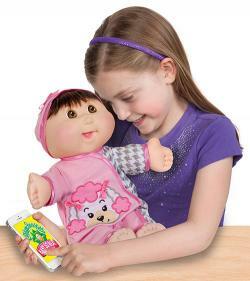 Nostalgia meets tech is definitely what the newest member of the Cabbage Patch family, Baby So Real, is all about. With moving eyes (thanks to LCD screens) and sensors throughout the body, when it is connected to the app, the doll can coo, talk, and even blink. Likewise, your child can tickle, play peek-a-boo, and get corresponding responses. Enable the switch on her back, and the entire experience can be ramped up. She will launch in fall of this year, and it is expected a boy version will follow in the future. Cost is $100.00. Elmo, in all his incarnations, is always a hit, and this year is no exception with the addition of the Love2Learn version. This time, Elmo not only plays games, sings songs, and makes really silly sounds, he also knows your child's name via the customizable app. The app also gives you the flexibility to select from different subjects, favorites things, and more, all of which Elmo will happily chat about with your little one. Imagine the conversation when he talks about real-time events, such as using the potty or cleaning up. 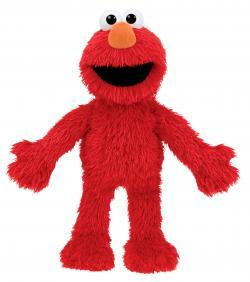 With over 30 minutes of content and 350 plus responses, Elmo will, surely, keep toddlers and preschoolers well engaged. Cost is $60.00. The 2016 Toy of the Year Winner for Games, this game has everyone laughing and posting online videos of the shenanigans an unexpected by- (or should it be "pie"?) product for young, old, and all in between. This works equally well for family night as it does for a 'tween or teen party. 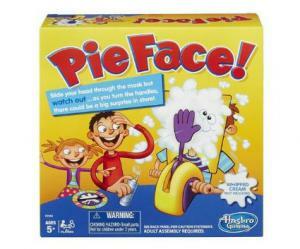 If you already have the game, look at the brand new Pie Face Showdown Game, a race to see who gets the pie first to double up on the fun. Cost is $20.00. For anyone familiar with Google Cardboard, this new spin on an old favorite is sure to be as much of a hit with the kids as it was with reviewers. It is has received high marks for the changes made between last year's model and this newer version. Designed to hold a wider range of smartphones, the Virtual Reality Viewmaster also includes a headphone jack adapter so regardless of where your phone's' jack may be, you should have easy access. A focus wheel allows for sharpening the image, too. It's a great way for kids to experience the virtual reality world. Cost is $40.00. Welcome the first-ever action heroes designed just for girls. Wonder Woman and her fellow female fighters of crime have finally made it and are already doing a great job combating the stereotype about who can save the world. Feminine, but strong with moveable joints, they are ready to take some bad guys down. 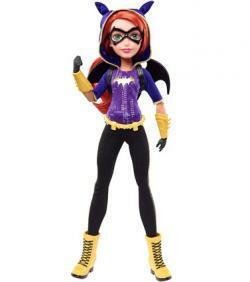 Whether Batgirl, Supergirl, or Wonder Woman, these action figures are sure to go places. Each costs $20.00. When grown-ups want what Barbie has, you can be sure that this will be on top of this year's wish list. Not only is this cool pad wi-fi-enabled so all the fun gadgets and gizmos sync up, but the dream house also had several modes, depending on what Barbie her pals are up to, like Hangout, Party, and Fun House modes, which create different environments in in the house. This place has everything, including a kitchen sink and an elevator, and when the top tech magazines in the country and talking about it, you know this mansion is something special. Cost is $200.00. Kick your kids' sneakers up to the next level by letting them add some Jetts to their wardrobe. 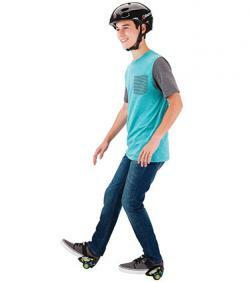 All they will need are their favorite sneakers, and the adjustable accessory easily works with kids shoe size 12 to an adult 12 regular. They also have a great spark pad that adds flare when your kids are cruising along the pavement. Fun for everyone and an excellent way to get everyone outside and moving, this may be the ideal gift for the whole family this year. The cost is $40.00. 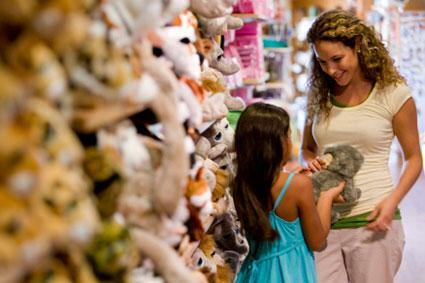 Top industry insiders, such as Oppenheim Toy Portfolio, ToyInsider, Toyland, Fat Brain, and Toy Fair organizer, Toy Industry Association. Family-focused guides like Parents Choice Awards, Hot Toy Guide, and Parents. News leaders CNBC, USA Today, and ABC News. Social go-to's Popsugar, Mashable, Best Products, and Brostick. Those making it on the 2016 Top Toys List were identified by at least two of those sources as key picks. While some were specific, most pointed more broadly toward the observed trends informing everyone from manufacturers to consumers when it comes to both producing and buying this season. As witnessed at the 2016 Toy Fair, there is a decided movement toward seeing nostalgic favorites being combined with technology, huge interest in DIY kits for kids ranging from science to jewelry making, and collectibles. Everyone across the toy industry is talking about trends this year, and it shows in the toys that are being called out as the ones to watch. Here is what those in-the-know have identified as the categories for which to be on the look out when making your own list. Miniatures: Shopkins, Tsum Tsum, Littlest Pet Shop Pets, and Playmobil toys are but a few of the product lines that fall into this category. Disney has a new line coming out this year called Disney Princess Little Kingdom Royal Sparkle Collection that features mix-and-match clothes, and the always popular LEGO Minifigures features their first ever wheelchair-bound person. Powerful women: This year is filled with "girl power," the likes of the Fashionistas with diverse body types and skin tones, and the fantastic Project Mc2 line of STEAM (Science, Technology, Engineering, Art, and Math)-centric dolls with the tagline, "Smart is the New Cool." And don't forget Barbie, who has also taken to, among other new aspirations, the 2016 Presidential Campaign trail. Tech Toys: Wi-fi-enabled toys can be found this year in unique ways from games like Actev Motors' Arrow Smart-Kart with an app that parents can use to control the go-kart's top speed or activate the emergency brakes. For kids who love video games, Pixel Press's Bloxels lets them arrange plastic pixel squares into slots on the special board, take a picture using the Bloxels app, and see their own interactive game created. There are even tech toys created for the aspiring designer, as seen with the Crayola Virtual Design Pro Disney Princess and DIY Gamer Kit. Life-like animals: Kid-friendly robotic buddies along the lines of Little Live Pets (puppy, turtle, bird, among others), Wow Wee's CHiP, and Zoomers (dinosaurs, kittens, and puppies) appear across the board. One of the ideas behind these "pets," is to give children the opportunity to (perhaps) learn about the caretaking of an animal. FurReal Friends has many animals, including Pax, My Poopin' Pup, which takes things a step further by, yes, pooping "cute poops." Construction kits: Not your parents' Lincoln Logs (although those are still around and remain popular), these kits have really ramped things up. While LEGO building sets continue to top many lists, particularly with the Star Wars products, others, such as Fort Boards, winner of Microsoft's Small Business of the Year, Magformer's Magnetic Building Construction Kits (2016 Toy of the Year finalist), C3's NBA basketball series, and the unique K'NEX sets are all popular. Whether instruction-based or left to a child's own imaginative blueprints, kids will want to build, build, and build some more. 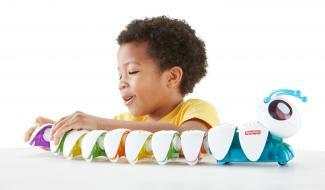 The ultimate may be the Real Construction Kits, which feature wood-like material designed just for kids. DIY/creator kits: Along similar lines to the construction kits, these products are wildly popular for inspiring creativity. Favorites for this year include Marvel's Create Your Own Comic Book, The Comic Book Kit, Skills for Life Kits (knitting, sewing, embroidery, even duct tape jewelry), and the Klutz series (mini erasers, pompom puppies, sew mini treats, and lots of others). It's crafty fun for everyone. Science kits: With STEM (science, technology, engineering, and math) and STEAM at the forefront for many, there is something to intrigue one and all. For example, Technology Will Save Us' kits (DIY Electro Dough Kit lets young scientists learn about electricity), award-winning kits from Green Kids Crafts (featuring earth sciences), and Educational Insights Nancy B's Mighty Microbes Lab make for great ways explore your child's interests. If you want to keep their scientific explorations happening all year long, you may want to consider monthly box subscriptions, such as the popular Tinker Crate/Kiwi Crate, Genius Box, or Spangler Science Club, that will keep the experiments, and learning, coming. Food prep: You only need to look at the plethora of food-based cooking shows to understand this trend. Playing to the culinary imagination, these products are tops among the "must-have's" for the young foodie this year. The S'mores Food Truck is designed to make, well, s'mores, and who wouldn't want to be able to bake their own Thin Mint cookies with the Girl Scouts Cookie Oven. While not "real," food, little ones will get a kick out of the play offerings, sushi to sandwiches, from Melissa and Doug. You may want to check out Candylicious Edible Bubbles, too, as they may be the perfect stocking stuffer for this year. Nostalgia: Games like Monopoly Ultimate Banking (with its own ATM, to be released later this year), Simon Air (no touching for this version though), and Mexican Train Dominoes (complete with train sounds) are fun for the whole family, but offer updated twists. Look for new versions of old favorites, such as Lite Brite and Strawberry Shortcake, who is still smelling as sweet as ever. Still popular are block sets like Guidecraft's Unit Blocks, Baby's First Blocks, and Earlyears Soft Busy Blocks, all of which are included in the Oppenheimer Toy Portfolio. Remote control: Back in force, RC toys of all different varieties, such as cars, drones, and even dinosaurs, made almost everyone's lists. Check out Go! Go! Smart Wheels Ultimate RC Speedway, Barbie's RC Hover Board, and DinoTrux RC, and be on the look out for late fall releases including the Flying Heroes Batman Batcopter. Surprise packs and blind bags: This year it seems the toys about which all the experts are excited are ones you can't even see until the package is opened! Continuing a trend that sees more entries this year, look for Num Noms, Funko Mystery Minis (Disney, DC Superheroes, even NFL collections), and DreamWorks Trolls, among others, with both first-time and new offerings. What's the appeal? Many contain items that are both limited and/or only available in this form, garnering much interest from collectors, regardless of age. Movie Franchises: Across the board, industry experts call out blockbuster movies as being something to watch for, as well. Plush from The Secret Life of Pets, Batman vs. Superman sports gear, and Disney Channel's new television series to premier this year, Elena of Avalon, featuring their first Latina princess, will definitely be merchandise for which to keep an eye opened. Getting ahead of the curve when it comes to gift giving, especially when your child or special kid in your life, can make or break a Christmas if expectations have a high bar set. While it truly is the thought that counts when it comes to presents of any kind, if you are in a position to obtain that coveted item, the response when it is unwrapped will be all the sweeter. Remember that the most important piece of the puzzle is to make sure, whatever you choose to purchase, it will delight and excite that little light of your life.